Well, after fishing up about 150 Furious Crawdads, I got a Mr. Pinchy! Unfortunately, on the first use, he wasn't too happy about me fishing him out of his lake, so he attacked me. I now must wait two days to see what else he might give to me. With luck, he'll give me a Magical Crawdad Box. If he doesn't, I'll have to wait 2 more days and use my third wish. If he once again stiffs me, I'll have to fish him up again and then I'll be mad. But I will get my pet crawdad. One way or another, it will be mine! I've seen a bunch of people post their UI's recently, so I thought I'd share mine. The main UI is based on Taeo's wonderful graphical setup. From there I have changed a lot, added a lot, and kept just a little the same. In the upper left hand corner, I have quick access to all 40 members of a raid. Using Aloft, I am able to color code every player in the game and these bars also change colors based on their status (e.g. if they need to be decursed). From there, down the left side, I have the Violation damage/healing meter and below that, my party members. Of course, the 40 raid bars only appear if I'm in a raid. Otherwise, I just have my party bars down below. Right in the middle of the screen, the place I'm looking at most times, is my, as I'll call it, Focus Bar. On the top half of the bar, I have two rows of buttons. These aren't used all that often, but does give me quick access to healing and mana potions, healthstones, and trinkets. Directly to the right of those buttons is Decursive. Decursive gives me one click access to decurse and polymorph players (in case of mind control). They are automatically sorted in my predetermined priority order (Warriors, Druids first as tanks). Below the two button bars is my character bar which obviously tracks my HP and Mana and then under Decursive is my target's bar. Right in the middle there is the target of my target. If I ever see that turn to me, I know I'm in trouble and I immediately hit "R" (my Ice Block). Below the focus bar is my main window. 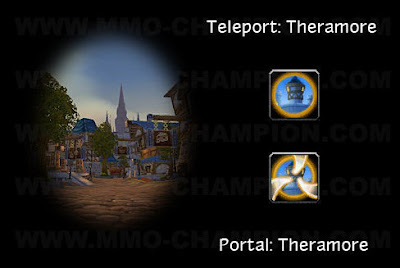 To the left is Guild chat, Raid chat, and when in cities, General and Trade chat. To the far right is HitsMode formatted combat text. In the middle, I have the wonderful Quartz casting bar and beneath that, three rows of buttons. The bottom row has all my teleports, portals, and food/water conjuring. As you can see, I have little numbers on every spell courtesy Dr. Damage. This in-game theorycrafting addon automatically updates how much damage each spell should do without a crit based on my current stats and buffs. It's pretty cool to watch these change as I get different buffs or use trinkets. Of course, I also have the minimap, but it's not cluttered with any buttons around it thanks to FuBar. The only icons that show up are the new mail icon and the battlegrounds icon (as seen in the shot above). The Simple Minimap addon allows me to zoom in and out on the map with the scroll wheel on my mouse, allows me to click and drag to pan around and allows the cool skinning as seen in my screenshot. Above my minimap, I have Sorren Timers. They don't track much, but the two most important things the timers do track are my spell steal for when I'm tanking Krosh Firehand and my sheeps. Basically #show Polymorph shows the Poly icon and tooltip when I mouse over the macro. /clearfocus [modifier:alt] clears whatever my focus is if I am holding down the Alt key. /focus [target=focus,noexists]; [target=focus,dead] will focus on whatever mob I have targeted only if my previous focus no longer exists or is dead. /cast [target=focus,exists,harm]Polymorph will cast Polymorph on my focus as long as it exists and is unfriendly towards me. And that's it. I have my Poly macro bound to my "G" key and before going into any fight, I just target my Poly target, hit "G" to focus on it and then target my DPS target. Then, all I have to do is hit "G" again to Polymorph my focus whenever it is in range and I after that spell is cast, I already have my DPS target targeted and I can start doing damage. If I need to resheep, I don't have to find my sheep target as it is already focused - all I have to do is hit "G" and it sheeps the focus as long as it is in range. If the sheep target is dead, it will focus on whichever mob I am currently targeting. It's a very useful macro and even though I put off using a Poly macro for a while, I'm now very happy I'm using it as the focus modifier is a godsend. To the right of Sorren Timers are my utility buttons - at the top, water and food, underneath 2 different versions of healthstones (the highest healthstone always gets placed on my "Focus Bar" as well), mana gems (conjur mana gems just to the right of the "for use" mana gems), mage food (with Ritual of Refreshment to the right), bandages, slow fall, mana shield, evocation, molten armor, mage armor, AI, hearth, disenchant, and then two utility buttons. The one in the very lower right is my "3" button. It's used for bombing runs, booterangs, and other such quests. I just replace it as I go and it gives me easy access to an item in my bank while out and questing. Above Sorren Timers and to the left of my utility buttons is Omen. The best threat meter on the planet and the one addon I could not live without. Above Omen are my buffs nicely categorized and tracked by Elkano's Buff Bars. They keep track of stacking buffs, debuffs, and weapon buffs. It also has my "tracking" skill there too which I can easily change at any time. And finally, across the top is the aforementioned FuBar. Starting at the far left I have tons of buttons for various addons I use. They provide quick access to configuration menus for Violation, BigWigs, and other stuff. In the middle I track my gold, my durability, and my trash can. On the right I have my location, number of friends online, number of guildies online, reputation tracker, tcgTradeskills, and information about my connection, FPS, etc. As you can see, I like to keep the middle of my screen clear. I used to use a heads up display, bu just prefer to have a clear, unobstructed view of the battlefield. I use enemy bars so I can quickly pick them out if they get close to me (in the screenshot above, Galv is too far away to have a bar above him), and I just like to have an open view (the view is much cleaner without a 40 man raid in the upper right). If you have any questions, or comments, please leave a comment and I'll respond ASAP. Another night of fishing for Mr. Pinchy has gone by. I collected 40 more Furious Crawdads, bringing my total to 100 caught thus far. The count will continue until I get my Pinchy! 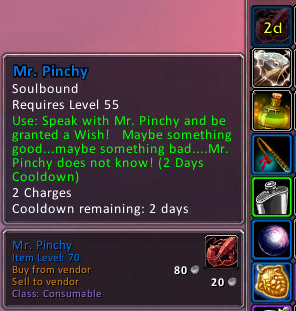 However, in Ironforge, as I was posing my crawdads for auction, I found a great deal on Enchant Weapon: Potency. It wasn't cheap, but it was the best deal I've seen in a long time (just shy of 600g). One step closer to to all my enchants! Last night, the Gold Team once again ventured back into Gruul the Dragonkiller's lair and quickly disposed of him. We wiped once on Gruul due to a horrible shatter but quickly took him down the second time through. For the second time in two weeks, he once again dropped two pairs of Leggings of the Fallen Hero. Again, this time I did not roll for them as we are now using a DKP system called EP/GP. It rewards both effort points (showing up on time, etc.) and gear points (gear that drops). And even though I'd like to have the pants to complete a Tier 4 set, I am not going to roll on them since I would not use them (Spellstrike is significantly better). But last night, once again, the difference between the two teams I have run 25-man content with was plainly clear. The Gold Team had clear leadership, we had all the classes in their respective channels, and everything seemed to go smoothly. We had a couple new people so the initial Maulgar pull took a couple of chances but we quickly took him out. This image (Gruul: Week 1) compares two teams on Gruul. The blue on the left is the Ungawa group I previously ran with. The brown on the left is the Gold Team I currently run with. When you look at total DPS, it's clear why Gruul will not die for my old team - DPS. Plain and simple. If we can average 8,104 DPS over a 25 man raid and they get to 6,500 or so, that is a provlem. Another thing you notice is 16 people survived all 100% of the fight and 7 of the remaining 9 lasted 90% of the fight. On the other side, you've got people dorpping off at 50 and 75%. Sure, we had an early death, but we pushed through and destroyed the Gronn. You also see at the top of our list, 2 mages, and 2 hunters. In the Ungawa group, there's 2 hunters at the top and the mages come in at #7 (lasted whole fight) and #10, 11 & 13 (died early - only one was going 600+ DPS). In this second week's numbers, you can see that our DPS actually increased from 8,100 DPS to over 9,200! Comador completely destroyed Gruul with over 1,000 sustained DPS and I lost a bit of DPS due to more movement (I was only able to DPS 91% of the time compared to 97% the week before). 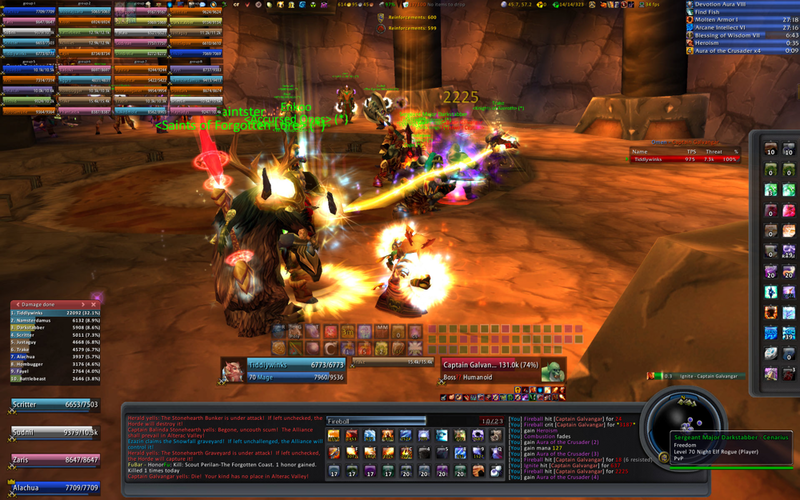 We had 13 people doing over 500 DPS, and 5 people doing 700+ DPS. Ungawa has 9 people doing 500+ DPS (2 died really early) and just 2 people doing 700+ DPS (none doing over 800+). Now, the point of the post isn't to point out one team being better than the other, but rather to show what dedicated players can accomplish. All too often with the Ungawa raids, I saw people show up without consumables. Not have enchants on their main set of gear. Having green gems in gear instead of blue gems. And just a laissez faire attitude towards raiding. On our side, we are all committed. We are all working to progress both individually and as a group. I really do hope the Ungawa team can continue to make gains, but I was just discouraged with the attitude of the group and they were attempting SSC without being able to down Gruul. We are able to one-shot Gruul on a consistent basis and we're planning on goin to Magtheridon soon. We have yet to step inside SSC. There's a reason you used to have to down Gruul and Magtheridon before going to SSC. There's a purpose behind the madness of Blizzard. Hopefully Ungawa will progress and figure out that attempting SSC without being able to down Gruul or Mag is a fruitless endeavor. Here is a locally hosted version of the WowWebStats from last night: here. Here it is on the WWS server: here. Today, after quickly running some Wintersaber and Timbermaw rep, I did my dailies and then went fishing. Did some quick fishing in Nagrand and got to 370 and then decided to test my luck fishing for Mr. Pinchy. I went over to Terokkar and started fishing the Highland Schools. After fishing up 60 Furious Crawdads, I called it a night and reveled in my full skills list. Speaking of which, time for a look at a great add-on I use. It's a Fubar plugin and is available at WowAce.com - tcg TradeSkills. It tracks tradeskills across all characters and servers if you so choose and also, and most importantly, tracks my cooldowns related to tradeskills. So right now I have it set to remind me every 30 minutes that I need to go make my cloth. As you can see in the screenshot below, both Spellcloth and Primal Mooncloth still waiting on cooldowns, while my Shadowcloth cooldown is 12 days past.